BUY DE MORNAS. - Climats d'Heures et de Mois. Climats d'Heures et de Mois. - BUY DE MORNAS. Title : Climats d'Heures et de Mois..
Map maker : BUY DE MORNAS.. Size : 15.7 x 21.7 inches. / 40.0 x 55.0 cm. 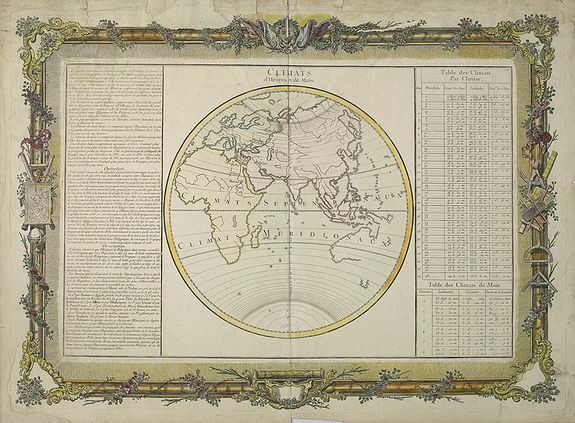 Description :Decorative map of the world showing one hemisphere divided into climates according to the length of the day. Left and right a box with information about these climates. Condition : Many repaired tears along marginal borders affecting coloured engraved frame all around. Paper aged-toned. Repair of tear in upper part center fold. Sold as is.